The day I started using Pure Vitamin C 21.5 Advanced Serum By Wishtrend I posted a snap on my Instagram and Facebook (if you’re not following me there then I think you totally should because everything goes up there first). Since then I received many queries from my readers asking me how the serum is working on me. I kept you all waiting this long (a month almost), apology for that but I wanted to be completely sure about my opinion. Vitamin C for skin has always been an attractive topic among all beauty lover. Around 4/5 years back I myself fell into this craze and tried to add vitamin C to my skincare regime. That time I wasn’t able to find anything as handy as Pure Vitamin C 21.5 Advanced Serum By Wishtrend is. So I went with web research based DIY vitamin C serum method with pure ascorbic acid ampoule. That was an epic fail. If you’re familiar with ascorbic acid and its characteristic then you’ll know already, why! Ascorbic acid is an unstable property that you barely can store. Additionally, I didn’t find it wise to use ascorbic acid directly on my skin. Eventually, my DIY madness didn’t take much time to catch sense. When I got the Pure Vitamin C 21.5 Advanced Serum in hand, needless to say, my memory with Vitamin C serum made me laugh so bad. I was excited as well to try it out after all this serum has a high concentration (21.5%) of Vitamin C that you can’t possibly find in anything else. If you do a bit of web search you’ll find there are a lot of scientific/medical explanation how vitamin C is a good old immunity boosting particle as well as a major ingredient in collagen synthesis. I want to simplify, vitamin C is a vital donor of electron thus it stimulates the process of cell regeneration as well as reduce the ratio of free radical damage. Oxidative damage and Photodamage/ photoaging (caused by UV rays) lead our skin to change its structure. In result, we get the aging sign, sag, and wrinkles. Vitamin C, when in the form of pure liquid (ascorbic acid), get directly into skin cells antioxidant in it neutralizes free radicals that age skin. In addition, the antioxidant function helps to regulate collagen synthesis process properly. Vitamin C heals wounds rapidly, however, open wound or inflammation might cause a mixed result. Although Vitamin C decreases skin roughness. Some research says that it might cause skin dryness. 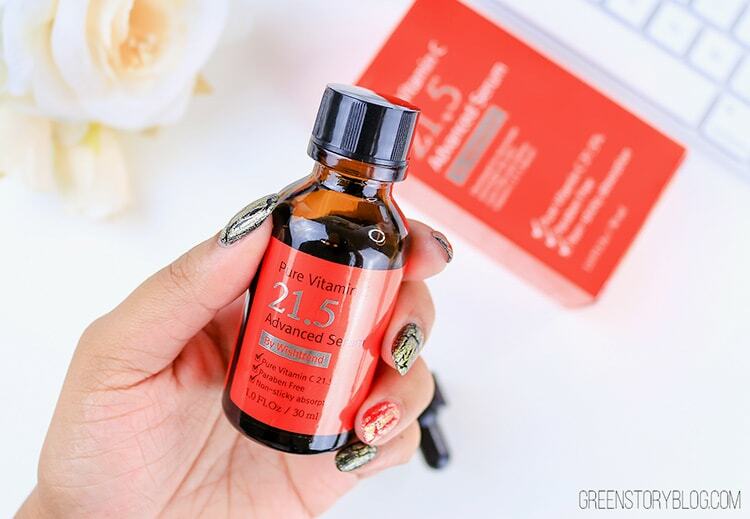 Pure Vitamin C 21.5 advanced serum comes in a tinted bottle (reminds me of ascorbic acid ampoule) and a glass dropper screw cap. After opening the initial cap it comes with you can simply put and keep the dropper cap on. Once the bottle is open you must keep it in the fridge and use up the product as soon as possible. Although it’s a serum because of the high consistency of vitamin c it is not stable in normal heat. The bottle contains 30ml of serum. This 30ml goes a long way as I have been using the serum for about 4 weeks, regularly. I need exact 7 drops for my face and neck. By now I finished only half of the bottle, seems it will serve me a month more. The packaging has the ingredient list and the direction of use in it. Click the picture in the gallery to read them clearly. I’ve added the serum in my night time skincare routine. Every night after washing my face I take out just 7 drops in my palm and pat it on my face and neck. I let it sit for 10-15 minutes then I follow up with my other skin care item. In the process, I’ve been avoiding my toner at night because I wanted my skin to get the serum directly, didn’t wanted the toner to disturb my serum afterward either. Instead of toner, I was just opting for a skin emulsion before my night moisturizer. Also, I’ve been using the serum only 5 days in a week and the rest 2 days I was doing my exfoliation and else. The serum is just water like, it’s not oily but not non-sticky either. However, the stickiness is very mild and goes off after using any other skin care product. Doesn’t have any strong scents or else. It has a very citrusy taste (in case the serum gets into your lips you’ll feel it :p), gives a mild tingling sensation if the skin has any kind of sensitive part or inflammation. That’s why I avoid using it on the day I exfoliate my skin or use any exfoliating mask. When I started using the serum my skin was pretty good in condition with no acne or breakouts but I do have kinda rough skin texture. In the first week, I was surprised seeing that the oil secretion of my skin has been noticeably controlled somehow. I was getting fresh, tightened and oil-free skin every morning. After the first week, I had to stop using it because I went for a holiday (read my Bali travel blog here). When I got back from holiday my skin was terribly tanned, almost closed to burn. I resumed my regular skin care routine along with the Pure Vitamin C 21.5 serum. After a week, I started noticing a big difference in my skin. My suntan was clearing out faster than ever I experienced before. In the second week, I was feeling somehow my skin texture is a bit smoother. Now at the end of the third week or so, I’m pretty much sure that my skin texture has improved a lot, pores in my nose area feels smaller, and my tan is almost gone. I’m truly impressed with the serum by now and already planning to make it permanent in my skincare routine. I haven’t faced any drying issue so far or any zit that might cause by the serum. This serum might help to fade out spot with long-term use, however, I’m not really sure of that because my spots are still the same. The way it helped me to get rid of the sun-tan I’m quite sure that the serum definitely helps to maintain the skin glow aka healthy skin. Now I’m looking forward to a less tired face and a bit more improvement in my skin texture. This serum is a high concentration of ascorbic acid so I don’t think it should be used in the daytime. Daytime use of it can cause sun sensitivity. I also think, while using the serum one should avoid sun exposure as much as possible or be very careful with the sunscreen(you can’t skip a high SPF sunscreen). The serum seems to be suitable for any skin type, however, if you have active acne you should avoid using it until the acne dries out. Also If you want to try a mild version then do read my post on Mad Hippie Vitamin C Serum. Do I recommend Pure Vitamin C 21.5 Advanced Serum By Wishtrend? Without any doubt, I do. Especially if you’re in your late 20s or more you must give this serum a try. *** Pure Vitamin C21.5 serum was sent to me by Wishtrend for reviewing purpose. Regardless, all my opinions are 100% honest and based on my own experience. Mad Hippie Advanced Skincare – Vitamin C Serum with Actives | A Gentle Vitamin C Serum that works! Shu Uemura Cleansing Oil | The Ultimate One-Step Makeup Cleanser? Is it available in kl? I heard about vit c serum must use after 20. But u hv mention dat ur pores bcme smaller. So i am really xcited to try it. Thanks for your review. I just bought one and will surely start using it. :D Will inform you about the result. Thank you so much for this article, was looking for a easy type review. Thanks. I’m glad Taskia that you liked my review. I would suggest, from my experience, to avoid other skin stimulating product such as retain A, strong skin brightening product or so if you’re using. Because vitamin C will stimulate your skin and if you use more of similar product then your skin might get angry. Keep everything simple while using it. Exfoliate skin once a week and skip using vitamin c that day. Less product is always more. Just maintain the basic needs. love your very detailed review on the vitamin C serum! what is the red serum? i never heard of that… would you mind telling me a bit about that? I’ve been wanting to try this serum for a long time! I’ve read so many rave reviews on it. I think it’ll be a good addition to my current skin care routine, especially since my face is prone to dark spots/hyperpigmentation. I love Vitamin C serum. I can’t find any resonably priced here in UK so i make my own. And vit c really make visible difference. I’ve never used a serum or treatment that’s pure vitamin C before… this makes me even curious. Thanks for sharing! I have never thought to use Vitamin C on my face. I have been using Organic Rosehip Oil, which has just been amazing. But I will definitely look into this.